There will be no further morning roundups of World Cup action for you to endure, but the sporting show must go on. One man who loves to put on a show is Jamaican Chris Gayle, although that’s usually with bat in hand. The big man can still bust out a dive when the situation requires it and, during Sunday’s Global T20 Canada League, he pulled off a stunning catch at slip. Representing the Vancouver Knights against the West Indies ‘B’ side in the tournament final, he snaffled up the edge from Kavem Hodge off the bowling of Fawad Ahmed. 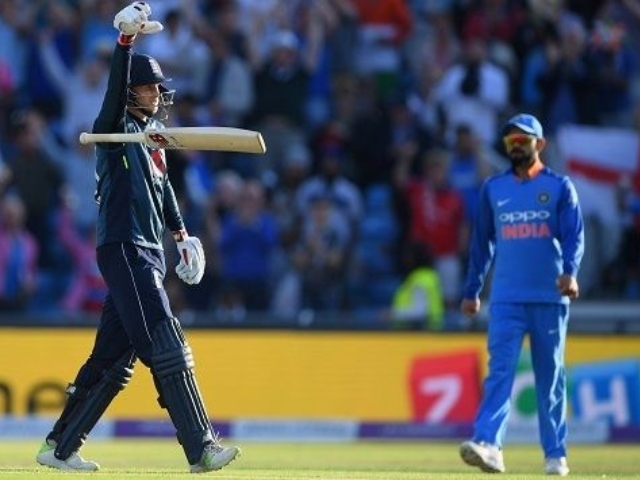 Plenty of cheek, but if we’re handing out awards then top spot goes to Joe Root, who cracked a century to guide England to an ODI series win over India yesterday. Root had been under some pressure to perform, having been dropped from England’s T20 team, and he couldn’t help but make a statement after a four sealed victory and his personal milestone. We would love it if Faf or Quinny did the same (they’d need to make some runs first, though), and you can bet it pissed off Virat Kohli and the rest of the Indian team. The start of the five-match England-India Test series is just a fortnight away, and Kohli will be desperate to make the Poms pay. Still, England’s ODI team does look like a hard nut to crack, and hosting next year’s World Cup tournament will make them outright favourites to win the cup. Too soon to say it’s coming home?